It's a smart day, then, for Bushmills to launch a big competition that your typical whiskey drinker would sell their granny to win. You can see all the details on Facebook. There are lots of cool components to the prize but the highlight is spending two weeks at the distillery learning how whiskey is made and then creating your own blend. They did this last year too. The winner then was Ivan Ivanov from Bulgaria who, after 28 days on site, spent two days sampling from casks, honing his very own whiskey. He managed to winkle a cognac-matured malt out of master distiller, Colum Egan, to marry with the more usual sherry and bourbon cask-matured whiskey. Matured in a cognac cask? That's quite a revelation, since such an exotic spirit has never escaped Bushmills in a bottle before. Let's hope this year's winners have a similar investigative zeal and can expose more of Bushmills' deepest secrets! The competition is open to Belgium, Bulgaria, Czech Republic, Germany, Ireland, Netherlands, Russia, South Africa, UK, and USA, which gives some insight into where Bushmills' key markets are. I have one tip for the eventual winners. Part of the prize involves Colum Egan coming to your home town and throwing a Bushmills-themed party (I'm starting to suspect that Colum Egan writes Colum Egan's job description). 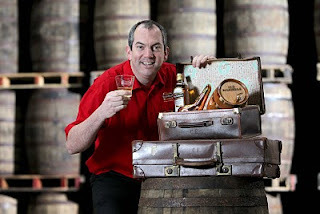 He says in the promotional video that he might bring along some of the Bushmills 12-year old Distillery Reserve. Well, insist that he does; it's gorgeous. I rate it higher than any other standard Bushmills bottling, aside from the 21-year old. As its name suggests, it's only sold in the distillery itself. Don't take my word for it, read what John Hansell said only this week. Oh, yes, one more thing. Bushmills, how about putting aside a bottle or two of the resulting blend for the Irish Whiskey Society? We'll set it before a room full of whiskey enthusiasts that will ensure the whiskey fulfils its true purpose: being consumed with great appreciation!